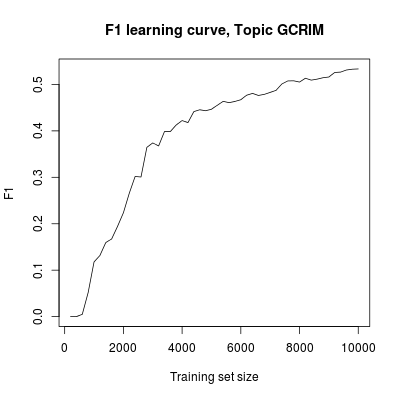 and advised to keep training until the classifier “stops improving”. And from this cost curve, seen only to the current training iteration, the manager must answer another question, on which the stopping decision fundamentally lies: will further training reduce overall cost? Giving a mathematically precise prediction in answer to this question is difficult, but a simple visual rule of thumb (informed by the system trainer’s experience and other evidence from the review process) is that, if total cost seems to be consistently climbing, it is time to stop. A trickier issue is that in practice we don’t know which are the responsive documents in advance (if we did, we wouldn’t be paying for a review), and so we don’t know the true shape of any of the above learning or cost curves. The best we can do is to estimate these curves, based upon a sample. How we can do that will be the subject of my next post. 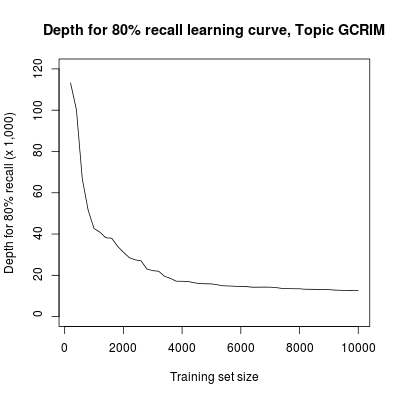 [*] To keep the discussion simple, we’re eliding the fact that responsive documents added to the training set also contribute to recall. We’re also eliding other complications of a real production, such as rolling collections, interleaving of training and test, assessor inconsistencies, and so forth.